The first day of the 2016 BB&T Atlanta Open kicked off featuring two players with local ties, headlining day matches. Trent Bryde, from Atlanta Georgia, took the court against Thiago Monteiro of Brazil in today's second match. The 16 year old Bryde was swept 6-0 in the first set as he was unable to find a rhythm against Monteiro and his serve. A long list of unforced errors would eventually be his downfall, losing the second set 6-2 to the 22-year old currently rankd No. 104 in the world. The official match time was just under an hour, but a rain delay one game into the second set would stop play for almost two hours. The break seemed to give Bryde a bit of confidence when he held serve and upped his aggressive play to bring the set score to two games a piece, but wasn’t quite enough to make a comeback a possibility on the overcast afternoon. Immediately following Bryde’s match, another Atlanta native, Christopher Eubanks took to the Stadium. A member of the Georgia Tech Men's Tennis team, Eubanks has had plenty of success at the college level and has even scored a few doubles wins on the ATP tour. In his second ATP singles match, Eubanks faced fellow American Tommy Paul. The 6’ 7” 20 year old Eubanks came out of the gate on fire taking the first set 6-2. A massive serve and crisp groundstrokes left Paul on the defense for most of the day and not able to push or make Eubanks get defensive. The second set would start a little differently as Paul found his confidence and jumped up to a 4-1 lead. Just when it looked as though Paul would force a decider, Eubanks turned up the volume on his strokes and brought the set to an even four games a piece. After a quick hold, Eubanks was up 5-4 and looked to close it out, but Paul wasn’t ready to go home just yet, holding to tie the set 5-5. Eubanks would then show veteran poise and take the next two games with a hard-hitting ground game to win the second set 7-5. This marks his first career singles ATP World Tour win, and moves him into the qualifying finals against Monteiro. The future looks bright for the young American and going deep in his hometown tournament could be the boost of confidence he needs to take the next step this week, for the rest of hs college career and even on tour. Second-seeded Tobias Kamke of Germany overcame American Michael Mmoh 6-4, 6-2 in the first match of the 2016 BB&T Atlanta Open qualifying. Kamke hit his stride late in the first set, breaking at 4-5 to close out the opener. Momentum carried over into the second set for Kamke, breaking twice and holding his own serve by winning 79% of first serve points. 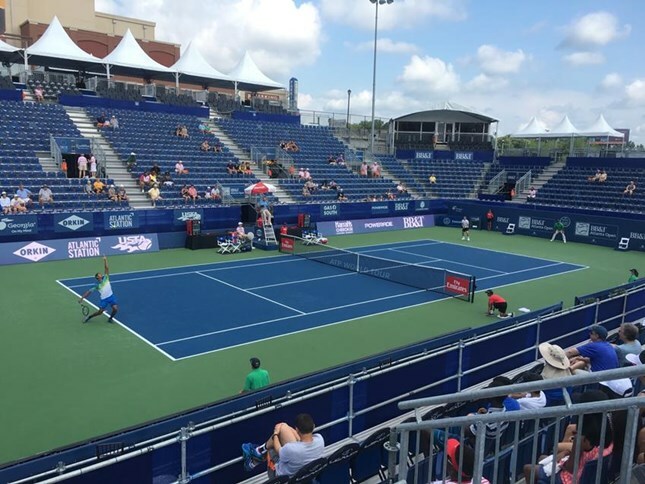 Two Americans waged a three-set battle late Saturday afternoon as Nicolas Meister defeated No. 8 seed Alexander Sarkissian 5-7, 6-3, 6-4. Frustration got the best of Sarkissian as he fell prey to Meister's all out hustle. In the first set, they exchanged breaks before Sarkissian earned aset point. However, after Meister took the second set, Sarkissian’s game deteriorated as his agitation became more obvious to fans and his opponent. In the final set, Sarkissian smashed his racket into the ground after delivering seven double faults. Meister maintained his steady drive and secured the third set going away with a service breaks.